Throughout history, social movements — small groups, loosely connected, but united by a shared purpose — have created transformational change. Women’s suffrage, Indian independence and civil rights, just to name a few, were all achieved by the powerless banding together against the powerful. Today, digital technology has intensified these forces, making it far easier for groups of likeminded people to connect and coordinate action. In recent years, the Color Revolutions in Eastern Europe, the Arab Spring, the LGBT movement and others have driven world events. There is greater opportunity to create change now than ever before. Yet the lessons of these movements transcend the political arena. As Moisés Naím pointed out in The End of Power, similar forces are transforming business, military affairs and even religion. So for managers who seek to create change, both within their organizations and in the marketplace, it is essential to learn the lessons of successful social movements. Most movements begin as a protest. People become unhappy with the present state of affairs and want something different. However, merely pointing out what you don’t like won’t get you very far. To actually create the change you want to see, you have to make an affirmative case and define exactly what you want to happen. Clearly defining change is a consistent theme running through successful movements. Gandhi wanted independence from the British. The civil rights movement wanted specific legislation passed. The color revolutions wanted a change in leadership. These were all tangible goals that they could build a strategy around. In a similar vein, when General Stanley McChrystal sought to transform military operations in Iraq, his mantra was “it takes a network to defeat a network” and he built his strategy for organizational change around that one simple principle. Lou Gerstner pulled off one of the most extraordinary turnarounds in history by refocusing his organization from its proprietary “stack” of products to its customers’ “stack” of business processes. So a good first step is to ask yourself, “If I were king or queen for a day, what would be different?” A revolution doesn’t begin with a slogan, but with a vision. 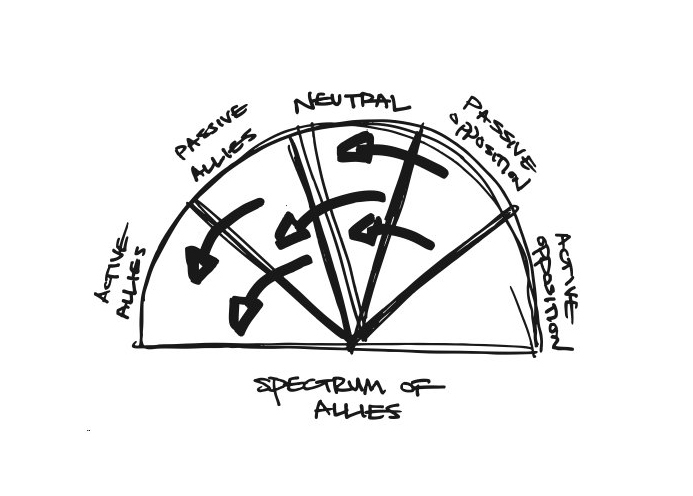 Once you have clearly defined the change you want to happen, you need to start building along the spectrum of allies, by outlining those that you can expect active or passive support, neutrality and active or passive opposition. As Sun Tzu wrote “know yourself, know your enemy and know the terrain.” The spectrum of allies is the terrain. What makes movements successful is not overpowering opposition, but undermining their support. So you want to work your way through higher and higher thresholds, starting first with active allies to activate passive ones, then bringing neutral groups over to your side. Once you start winning over the passive opposition, you’re on the brink of victory. For example, in the civil rights movement, Martin Luther King first helped to mobilize southern blacks, but then shifted to bringing northern whites over to his cause. And when Harvey Milk began the LGBT movement, he started with gay people on Castro St, but then moved on the straight liberals in the Bay area. Colonel John Boyd, the military reformer, pursued a similar path, first preparing briefings for junior officers, then congressional staffers, then elected officials. He moved on to the top generals last. All too often, movements seek merely to inspire, without asking questions like, Inspire who? How? And “for what? Make no mistake, if you don’t develop with a plan to persuade, your movement is unlikely to get very far. While it is crucial to recruit a spectrum of allies, it is also important to identify the institutions that have the power to implement the change you seek. These “Pillars of Power,” can be the police, the media, the education system, government agencies and other organizations. As important as popular support is to a movement, without institutional support, little is likely to change. In Serbia’s Bulldozer Revolution, the revolutionary group “Otpor (of which Srdja was a founding member), saw arrests not merely as an act of defiance, but as an opportunity to build positive relations with the police. In fact, protesters were trained to defend officers from any provocation within their own ranks. Executives who seek to create transformational change within their organizations or in the marketplace need to take a similar approach. Which stakeholders inside and outside your organization have the power to implement or resist change? What are their incentives? How can they benefit or be hurt by the change you seek? These are all things you need to address. Former Blockbuster CEO John Antioco learned this lesson the hard way. Contrary to popular belief, he and his team devised a viable strategy to meet the challenge that Netflix represented and soon began making traction with customers. From a conventional strategic perspective, they did all the right things. However, the team failed to identify important stakeholders and earn their support. Investors balked at the cost of the changes and franchisees complained that the online business would siphon off their revenues. Antioco was fired, the strategy was abandoned and, five years later, Blockbuster went bankrupt. Every movement seeks to correct some injustice. So it’s easy to fall into the trap of demonizing the other side. Yet this is where many movements go off the rails. Anger is an effective mobilizer, but anger without hope is a destructive force. You need to make an affirmative case and affirmative tactics. Cheap, easy to replicate and low risk tactics are most likely to succeed. Because that’s how you can mobilize the numbers you need to influence a pillar of power, whether the goal is disruption, mobilization or to pull people from the middle of the “Spectrum of Allies,” especially if your tactics are seen as positive and good humored. Blocking streets and throwing rocks at the police is most likely to turn off those in the middle of your spectrum of allies and will make it decidedly more difficult to gain support from the institutions inside the “Pillars of Power.” During the 2016 Presidential election, for example, the Bernie Bros, may have riled up Sanders’ most ardent supporters, but likely turned off many that he desperately needed to win over. Ironically, one of the most dangerous stages of a revolution is just after victory has been won. In Ukraine’s 2004 Orange Revolution, they were unable to create a unified, effective government and soon the country devolved into chaos once again. Secular protesters prevailed in Egypt in 2011, but the it was the Muslim Brotherhood that won the elections that followed. As we have seen, the same thing can happen in organizations. John Antioco rallied Blockbuster’s executives around his plan to compete with Netflix, but was thwarted by investors and franchisees who never go on board. In a similar way, while Colonel John Boyd did much to reform the Pentagon, military contractors still wield enormous influence. So it’s important to not confuse the movement for change with the values that the movement seeks to represent. Just because you win an election or get a program approved and funded, doesn’t mean it’s time to declare victory. In fact, it’s at this point that you must strengthen alliances and renew each stakeholder’s commitment that created change in the first place. As Moisés Naím wrote, today “power is easier to get, but harder to use or keep.” So to truly revolutionize how things are done, it’s not enough just to change a policy or shift leadership to a new regime. You must change the beliefs that lead to actions and that is not a series of events, but a continuous struggle. Managers today closely study the lessons of business greats like Henry Ford, Steve Jobs and Jack Welch, but maybe it’s time that they begin to look at Gandhi, Martin Luther King and Harvey Milk as well. This post was co-written with Srđa Popović, the Executive Director of the Center for Applied Nonviolence Action and Strategies. Named (CANVAS). Named one of Foreign Policy’s Top 100 Global Thinkers and author of Blueprint for Revolution, he was previously a founder of Otpor!, the Serbian youth movement that toppled Slobodan Milosevic. Greg Satell is a popular speaker and consultant. His first book, Mapping Innovation: A Playbook for Navigating a Disruptive Age, was selected as one of the best business books in 2017. Follow his blog at Digital Tonto or on Twitter @Digital Tonto.